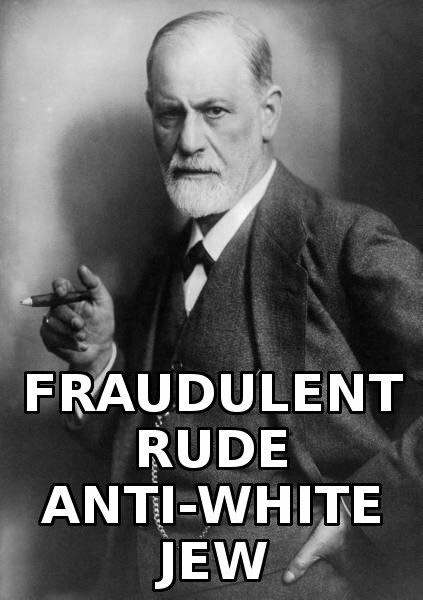 The Freudian Cover-up is a theory first popularized by social worker Florence Rush in the 1970s, which asserts that Sigmund Freud intentionally ignored evidence that his patients were victims of sexual abuse. Early within Freud’s career, he believed that little girls often experienced sexual abuse, since most of his patients were predominantly women and consistently reported childhood instances of sexual molestation. Many of Freud’s patients suffered from a common Victorian diagnosis, hysteria. Since his hysterical patients repeatedly reported sexual abuse, most often naming their fathers as the abusers, Freud drew a causal connection between sexual abuse and neurosis. This became the frame for the seduction theory, in which he pointed to a direct connection between sexual abuse in childhood and adult hysteria. According to Florence Rush, author of The Freudian Cover-up, this repeated and persistent incrimination of fathers by his patients made him uneasy, and led him to abandon the seduction theory. Freud’s early patients were almost exclusively Jewish women, yet there is little mention of this in Freud’s writings. Working with these women, Freud recognized the limitations of electrotherapy, the treatment of choice for mental illnesses such as hysteria, and argued that electrotherapy was successful only because of its suggestive effects rather than because of its actual effect on the nervous system. The missing variable in Freud’s rejection of electrotherapy, as Gilman notes, was the prevailing question in 19th-century medicine: race. Indeed, Freud found, upon his return to Vienna from Paris, that statements about the Jewish predisposition for forms of mental illness were commonplace. In fact, some sought to make a distinction in mental stability between secular and nonsecular Jews. These debates led Freud to abandon the idea of hysteria as an inherited disease with a racial component. 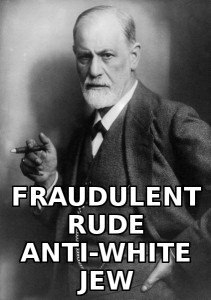 The so-called Freudian coverup happened at about the same time jews generally began abandoning the idea of race and started pushing anti-White “anti-racism” instead, just as an immune response to rampant jewing in Europe, the first truly racially-aware White state, was rising to state power in Germany. What a cohencidence. In Fear and Loathing and Treason – Part 1 and Part 2 I discussed the psychological motives and mechanics of the White traitors aiding and abetting the invasion and colonization of Europe by “refugees”. By conventional understanding, a collaborator is one who assists an enemy, helping groups to which he does not belong threaten groups to which he does belong. But this definition, it seems to me, is too restrictive. It presumes that a group is a discrete whole, that once in it, we can’t get out of it or have competing affiliations. Collaborators, however, cannot be so neatly bound. Whether we belong to one group or another in some existential sense, in the course of our lives we do incur moral obligations to our comrades and friends, whom we betray when we aid our opponents. But to avoid the question of identity that restrictive definitions of collaboration entail, I will use the definition contained in the word’s Latin root collaborare: “to work together.” By collaborator, I simply mean those men and women who work with jews and who occupy the lower tiers of power and make political fear a genuinely civic enterprise. The collaborator confounds our simple categories of jew and victim. Like the jews, the collaborator takes initiative and receives benefits from his collaboration. Like the victim, he may be threatened with punishment or retribution if he does not cooperate. Many collaborators, in fact, are drawn directly from the ranks of the victims. Perhaps then we can distinguish between collaborators of aspiration, inspired by a desire for gain, and collaborators of aversion, inspired by a fear of loss. The first are akin to jews, the second to victims. 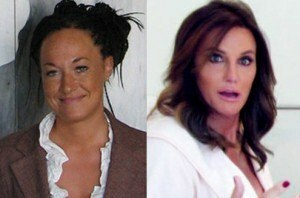 But even that distinction is too neat. Jews also fear loss, and victims hope for gain, and as the economist’s notion of opportunity costs attests, the hope of gain often informs the fear of loss. Collaborators serve two functions. First, they perform tasks that jews themselves cannot or will not perform. These tasks may be considered beneath the dignity of the jews: cooking, cleaning, or other forms of work. They may require local knowledge—as in the case of informers, who provide information jews cannot access on their own—or specialized skills. Second, collaborators extend the reach of jews into corners of society that jews lack the manpower to patrol. These collaborators are usually figures of influence within communities targeted by jews. Their status may come from the jews, who elevate them because they are willing to enforce the jews’ directives. More often, their authority is indigenous. Figures of trust among the victims, they can be relied upon to persuade the victims not to resist, to compound the fear of disobedience the victims already feel. Because their functions are so various, collaborators come in all shapes and sizes. Some travel in or near the orbit of jew power; others are drawn from the lower orders and geographic peripheries. One common, though unappreciated, influence upon their actions is their ambition. While some collaborators hope to stave off threats to their communities and others are true believers, many are careerists, who see in collaboration a path of personal advance. Whether the payment is status, power, or money, collaboration promises to elevate men and women, if only slightly, above the fray. Though ambitious collaborators like to believe that they are adepts of realpolitik, walking the hard path of power because it is the wisest course to take, their realism is freighted with ideology. Careerism has its own moralism, serving as an anesthetic against competing moral claims. Particularly in the United States, where ambition is a civic duty and worldly success a prerequisite of citizenship, enlightened anglers of their own interest can easily be convinced that they are doing not only the smart thing, but also the right thing. They happily admit to their careerism because they presume an audience of shared moral sympathy. A further examination of the rational and emotional machinations which enable White genocide. As the Wikipedia article describes it, the streetlight effect is a type of observational bias where people search where it is easier, rather than where it would be more fruitful. Over the course of the past year or so I’ve laid out what I think has been a thorough and fairly stated critique of what others refer to as “White pathology”, and specifically what they call “pathological altruism”. The key point I return to, again and again, is that there is a pathogen, an Other, an enemy. The jews. My criticism, to put it simply, is that much of what is labeled “White pathology” is a result of enemy action. In fact I’ve gone farther and pointed out that if Whites exhibit any behavior which could justifiably be called pathological, symptomatic of a collective mental disease, then it would be how Whites collectively fail to perceive jews collectively as a mortal enemy. And this in spite of the jews’ relentless expressions of alienation and hostility, made most plain in the victim narrative jews never tire of recounting. In essence the jewish narrative portrays the jews as entirely blameless and eternally oppressed by “anti-semites”, which by their own telling includes every people they’ve ever come into contact with, but most recently is primarily Whites. Their holocaust narrative is the latest, most specific, most in-your-face example of this narrative. In other words, jews clearly see Whites as their enemy, and you can hear them more or less openly lecture everyone about this in their media and from their privileged perches in universities and corporations and government any day of the week. Yet even Whites who have demonstrated some greater than average racial consciousness and even an awareness of the jews seem prone to discount the impact of jewish hostility, their influence, or both. Instead they hypothesize some mysterious inborn defect in Whites, some baked-in weakness that makes Whites vulnerable, with the premise that it has nothing to do with the jews. As I’ve pointed out, this desire to search within their own collective – to look where the light is best so to speak – is itself, I think, a symptom of the very weakness they’re looking for. There is another recurring theme, or to put it more bluntly another elementary error, which occurs in many attempts to understand and explain collective behavior using terms which are ordinarily used to describe the motives and behaviors of individuals. Using the term suicide instead of genocide is a good example of both mistakes – blotting out the jews and personalizing the problem at the same time. The psychological term “self-deception”, as in “jewish self-deception” is another. I’ve argued that it should really just be called jewish deception. The real “self-deception” is in White individuals who misinterpret the persistent and collective nature of jewish lying. The error in such individualistic terms is that it inevitably personifies and thus distorts the problem, even if only in the minds of listeners. The speaker may simply be grasping for words, with a preference for familiar terms, where there seems to be more light. In my opinion blunter language is ultimately more fruitful, even if we must invent or call in other terms so as not to misunderstand or misrepresent what is in truth a collective phenomena. A few months ago I spoke about Stockholm Syndrome and Gaslighting, trying to address these errors and to offer some other psychological terms and concepts which I think better fit the relationship between Whites and jews. In particular, that it is a relationship, and that it is an asymmetic, abusive parasitic relationship in which jews benefit and Whites are harmed. Gaslighting or gas-lighting is a form of mental abuse in which information is twisted/spun, selectively omitted to favor the abuser, or false information is presented with the intent of making victims doubt their own memory, perception and sanity. The obvious analogy is that the jews and their holocaust guilt-tripping and psychoanalytic theories of “anti-semitism” are the mental abusers, the sociopathic liars who deny any wrongdoing, and Whites are the victims of their mental abuse, and exhibit various “white pathologies” as a result. 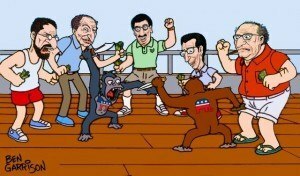 I’ll emphasize again right here that I’m drawing an analogy. It’s not a perfect fit. For one thing, gaslighting ordinarily describes a relationship between two individuals, whereas the analogy I’m making is for the relationship between Whites and jews collectively, even though within those collectives there are a broad spectrum of individual motives and attitudes. Here’s a bit more about these kinds of relationships, specifically to the point of anyone who says what I’m presenting is an argument that Whites are blameless. So far I’ve used the word “victim” to describe the women (or men) who suffer at the hands of psychopaths. Yet I don’t really like this word for several reasons. It tends to imply a certain passivity, as if the woman herself had nothing to do with the decision to get involved with the psychopath or, worse yet, to stay with him even once his mask of sanity started to slip. It’s rare that a psychopath physically coerces a woman to get involved with him or to stay with him. Although he intimidates and brainwashes her, generally the victim cooperates. A victim of Stockholm Syndrome irrationally clings to the notion that if only she tries hard enough and loves him unconditionally, the abuser will eventually see the light. He, in turn, encourages her false hope for as long as he desires to string her along. Seeing that he can sometimes behave well, the victim blames herself for the times when he mistreats her. Because her life has been reduced to one goal and one dimension which subsumes everything else–she dresses, works, cooks and makes love in ways that please the psychopath–her self-esteem becomes exclusively dependent upon his approval and hypersensitive to his disapproval. As we know, however, psychopaths and narcissists can’t be pleased. Relationships with them are always about control, never about mutual love. Consequently, the more psychopaths get from their partners, the more they demand from them. “The combination of ‘Stockholm Syndrome’ and ‘cognitive dissonance’ produces a victim who firmly believes the relationship is not only acceptable, but also desperately needed for their survival. This calls to mind recent statements by Manuel Valls in France and Joe Biden in the US concerning how absolutely essential jews are. Solipsism (Listeni/ˈsɒlɨpsɪzəm/; from Latin solus, meaning “alone”, and ipse, meaning “self”) is the philosophical idea that only one’s own mind is sure to exist. Metaphysical solipsism is the “strongest” variety of solipsism. Based on a philosophy of subjective idealism, metaphysical solipsists maintain that the self is the only existing reality and that all other reality, including the external world and other persons, are representations of that self, and have no independent existence. In the view of a White racial solipsist other races have no independent existence, no agency. It is a form of extreme ethnocentrism, a focus on the collective self to the point of ignoring enemies – a pathological ethnocentrism. Much of the point of the Sophists was to show that “objective” knowledge was a literal impossibility. (See also comments credited to Protagoras of Abdera). The foundations of solipsism are in turn the foundations of the view that the individual’s understanding of any and all psychological concepts (thinking, willing, perceiving, etc.) is accomplished by making analogy with his or her own mental states; i.e., by abstraction from inner experience. And this view, or some variant of it, has been influential in philosophy since Descartes elevated the search for incontrovertible certainty to the status of the primary goal of epistemology, whilst also elevating epistemology to “first philosophy”. There an element of what the jew fraud Freud called projection in there. And the common understanding of the word comes with quite a bit of individualist and philosophical freight. Rather than trying to tack a racial qualifier on solipsism I think a term like pathological ethnocentrism is the better fit. In Greek mythology, Narcissus (/nɑrˈsɪsəs/; Greek: Νάρκισσος, Narkissos) was a hunter from Thespiae in Boeotia who was known for his beauty. He was the son of the river god Cephissus and nymph Liriope. He was proud, in that he disdained those who loved him. Nemesis noticed this behavior and attracted Narcissus to a pool, where he saw his own reflection in the water and fell in love with it, not realizing it was merely an image. Unable to leave the beauty of his reflection, Narcissus drowned. Narcissus is the origin of the term narcissism, a fixation with oneself. The self-attraction/self-infatuation of narcissism is broadly understood. That this weakness is exploited and made fatal by a hostile Other, a nemesis, is not as well known. Multiple versions of the myth have survived from ancient sources. The classic version is by Ovid, found in book 3 of his Metamorphoses (completed 8 AD); this is the story of Narcissus and Echo. One day Narcissus was walking in the woods when Echo, an Oread (mountain nymph) saw him, fell deeply in love, and followed him. Narcissus sensed he was being followed and shouted “Who’s there?”. Echo repeated “Who’s there?”. She eventually revealed her identity and attempted to embrace him. He stepped away and told her to leave him alone. She was heartbroken and spent the rest of her life in lonely glens until nothing but an echo sound remained of her. Nemesis, the goddess of revenge, learned of this story and decided to punish Narcissus. She lured him to a pool where he saw his own reflection. He didn’t realize it was only an image and fell in love with it. He eventually realized that his love could not be addressed and committed suicide. Again, the Other plays a key role. In this case there is a gaslighting Other as well as the vengeful Other. There are other versions. 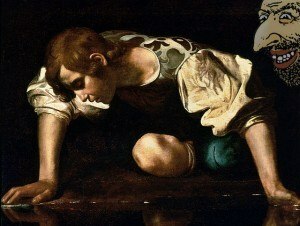 All end in the death of Narcissus – which is the moral of the story. 4. Eye for an eye. I’ve written extensively that we are giving, altruistic species (see Geher, 2015). But we’re not dumb. The nature of altruism in a species like ours is conditional – we tend to help in a strategic manner. We tend to help people who have helped us in the past. Helping others who don’t help you leads to a scenario of possible exploitation, and evolutionary forces would have selected against such non-reciprocated helping (see Trivers, 1971). Similarly, it’s not good social policy to be a punching bag. If you let someone walk all over you and don’t retaliate, then (a) that person learns that he or she can continue to be a jerk to you and (b) others come to see you as exploitable. The whole “eye for an eye” things helps us understand all of these dynamics. 2. Tail between your legs. Across many species, dominance hierarchies exist in social contexts (see Geher, 2014 for a summary of this concept). And lots of non-verbal behavior is associated with dominance-related contexts. When two dogs squabble for dominance, the loser takes on a unique and highly observable posture – it walks away with its tail between its legs. This is a signal that it has tried to achieve a higher status position than it really warranted – and is now signaling all this information to the others. When a person makes a bold social move that fails, you can see it in his or her face – as if he or she is a dog walking with its tail between its legs. It’s easy enough to apply these terms to the anti-White/pro-jew zeitgeist. In the wake of the last big squabble for dominance seven decades ago the non-reciprocating eye-for-an-eye jerks have dominated and exploited the dumb punching bag losers, flaunting “our” altruistic norms not only without retaliation but with Whites instead tucking tail. This way of describing the psychology seems more illuminating than the “pathological altruism” rhetoric I’ve been criticizing recently.